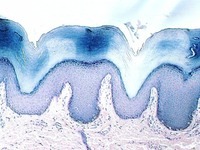 SIMPLE SQUAMOUS | Microanatomy Web Atlas | Gwen V. Childs, Ph.D. 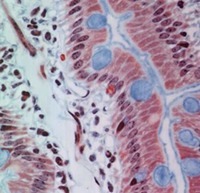 The epithelium lining capillaries is simple squamous as seen in the structures labeled “ capillary" in the spinal cord slide. The large cells with dense purple bodies are spinal motor neurons. Can you find the nucleus of an endothelial cell (the cell that lines the capillary)? It is very flat and scale-like. 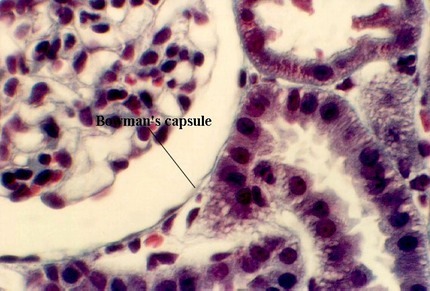 Another example is in the epithelium lining Bowman's capsule (inside circle) or the capillaries in the glomeruli of of the kidney is simple squamous. Can you find red blood cells in the capillaries? Hint: they are stained bright red. 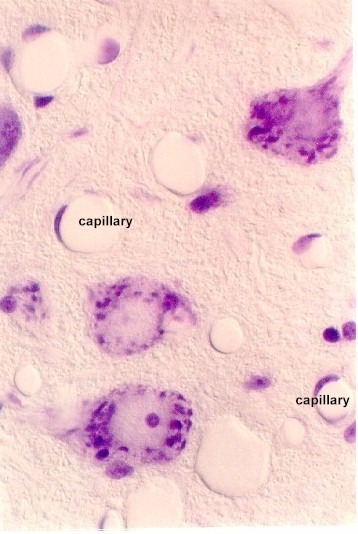 The dense purple bodies are the nuclei of the various cell types. 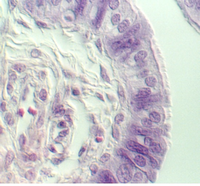 What other type of epithelium do you see in the above image?